Also known as Swine's snout, Blowball, Cankerwort, Lion's tooth, Puffball, Clockflower. There are more than 250 dandelion species in the UK alone. A golden flower head with a hollow milky stem . Leaves are irregular and jagged. The seed head is a white fluffy puffball packed with scores of tiny parachute like seeds which are blown into the air. 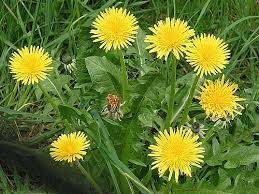 Dandelion is a natural diuretic and has traditionally been used for urinary disorders and poor digestion. It is high in potassium, other minerals and vitamins and so considered a good general tonic. 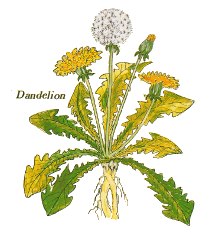 Arabian physicians in the 10th and 11th centuries recommended dandelion to restore health. The milky white sap eas once used to remove warts. Dandelion Clocks - The fluffy seedheads open fully in fine weather and tends to shut as rain approaches. Many people will remeber as children blowing the seed heads of the stalks and telling the hour by how many breaths it took to blow them all off.